Okay, I suppose if you bought it at the store, it could be easier. And also delicious. But for practically free, this is darned tasty, and the freshness is unbeatable. Oh, green salsa. I love me some green salsa. 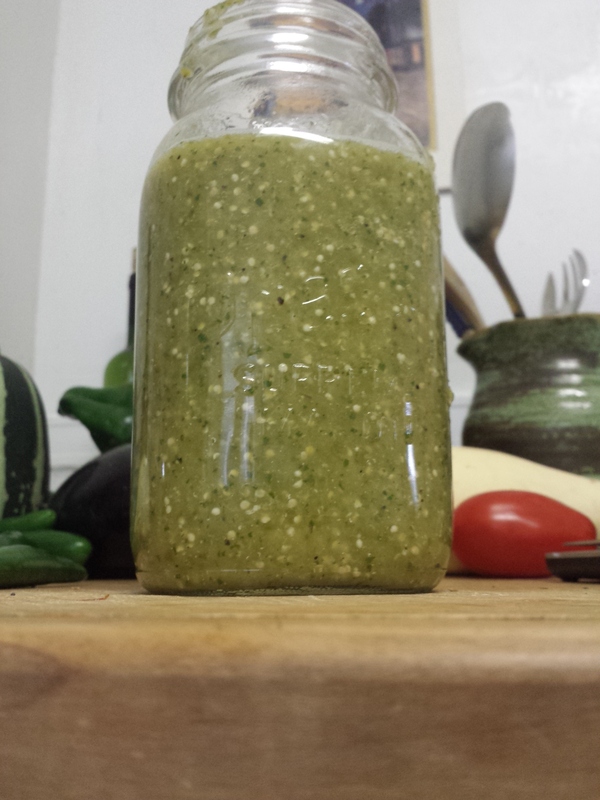 And borne of the “I didn’t meal-plan this week” quandary and the “it’s August, so my counter is overflowing with produce” solution, this green salsa did not disappoint. An aside: I used to think green salsa was made from unripe tomatoes, and embarrassingly found out it comes from a whole different plant in my mid-twenties, when I began gardening. I didn’t grow tomatillos this year, but that’s okay, because I live a mile away from the Sunday farmers market that sells them for pennies. On a typical weeknight when I haven’t planned dinner and don’t feel like putting in work to eat, I will stir-fry whatever veggies are on the counter with whatever starch is already cooked, in whatever fat sounds like an appealing complement, adding to it whatever ethnicity of spices and herbs I feel like. It’s a pretty lazy way to get food down the ol’ gullet, but really, the operative word for weeknights is “easy,” and it tastes good. That works for me, especially while cooking for one as I so often am during this period while Joe’s in school. Tonight I feel particularly celebratory, because, guess what?! 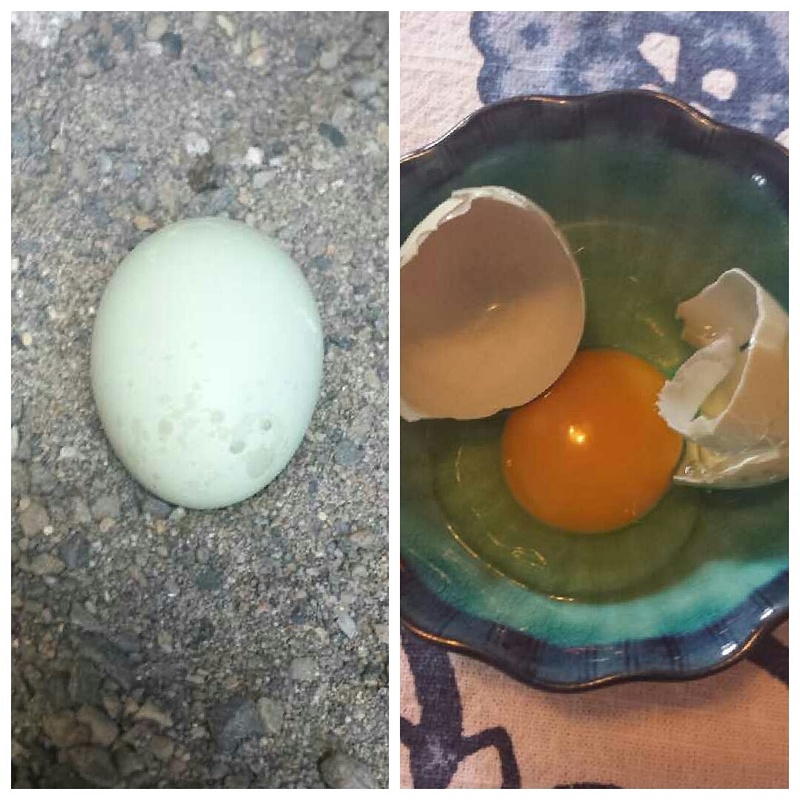 A FREAKING EGG! I am so excited about this tiny little mint-green bugger, the first fruits of all my chicken labor, I could dance around like an idiot. (I did.) Our six chicken ladies have been squawking all weekend, worryingly and at high volume, and though I knew it probably meant they were about to start laying for the first time, I still went through online forum after online forum, trying to ensure they didn’t have some terrible disease brought on by my inept avian-parenting. Avi-arenting? The ladies are okay after all – Tramp, the chicken in question, has quieted down and I imagine more eggs will soon follow. So anyway – tonight I am celebrating. And celebrating means cooking. It means that for dinner, I didn’t just eat stir-fry. I ate stir-fry topped with homemade, roasted tomatillo salsa! Yes, that is how I celebrate. Also, like a badass, I didn’t clean up. 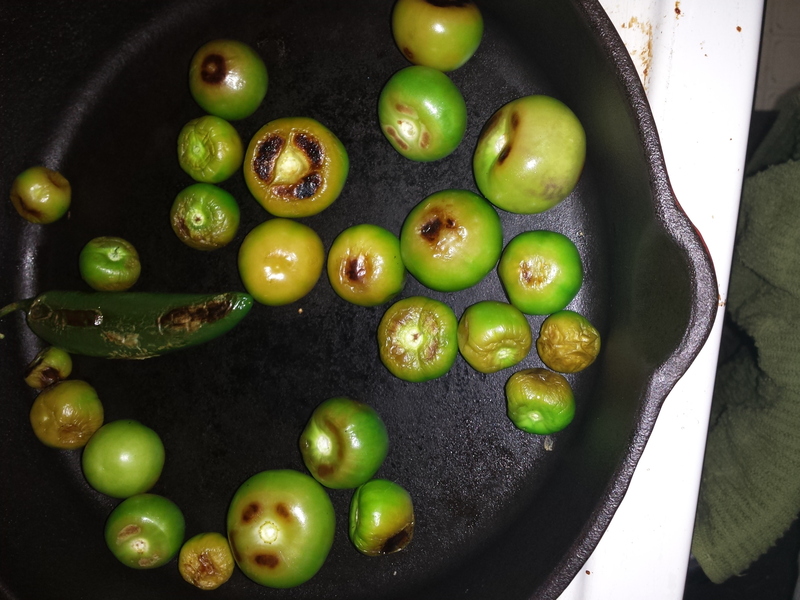 Heat a 12-inch cast iron skillet to just over medium, and roast the tomatillos and jalapeno whole. This takes a few minutes. I spend the first few minutes flicking the pan’s contents around with my fingers, and then when they get too hot, I stir them around with a straight-edged spatula. You want a good portion of the tomatillos, and especially the jalapeno, to have developed some char. Throw half a medium onion in the pan for the last couple of minutes. Zizz up the tomatillos, jalapeno (stemmed for sure, and seeded if you like it mild), the onion half, two peeled garlic cloves, the cilantro, and the sea salt in a food processor or blender. All these ingredients should absolutely be adjusted to taste. You want to like it, right? Done. This recipe is on the mild side of medium, heat-wise, and makes nearly a quart, which is great because those little pansy 8-oz. containers of store-bought salsa last about 20 minutes once opened in our home. We are salsa lovers. I thought I’d show off my celebratory stir-fry, even though it’s neither well-presented nor well-photographed. Another thing we’re about in this household is authenticity. If you’re looking for a dinner idea, this is leftover rice stir-fried in olive oil with summer squash and the other half of my salsa onion, seasoned with chili powder. 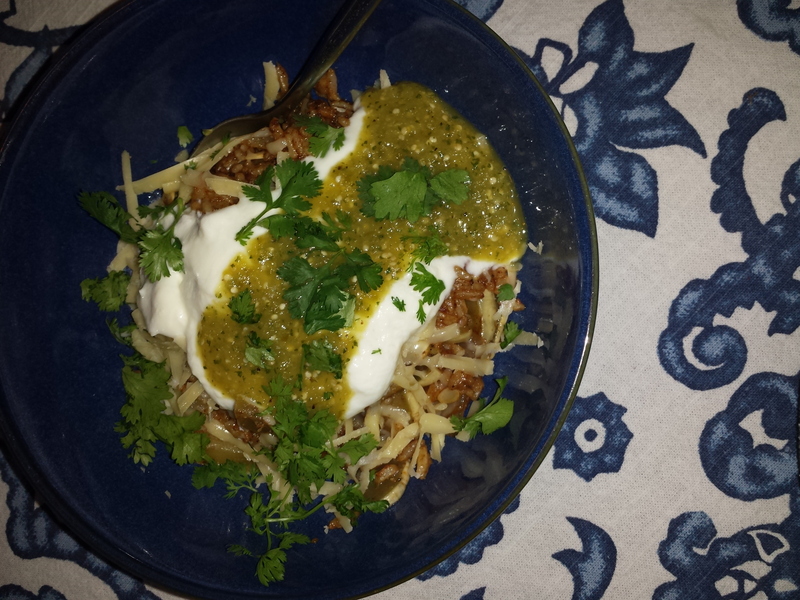 It’s topped with a smidge of white cheddar, plain yogurt, the famed salsa verde, and a little cilantro. Since these two things have made my Monday sweet, I wish for you, today, a wonderful dinner and the happiness equivalent of discovering your first egg. 12 Aug	This entry was published on August 12, 2014 at 3:17 am and is filed under Collection. Bookmark the permalink. Follow any comments here with the RSS feed for this post. Eggs with salsa verde are the best! Have you made migas or chilaquiles? Do it! !